This week’s photo comes to us of Juli of Inspiri Body. It really has an artistic flair to it and it reminded of some yummy artisan chocolates that I’ve seen (and eaten)! Juli said, “I used two techniques in one soap. First, I used a discoloring fragrance (Warm Vanilla Sugar) to my advantage and tried to make a Mantra Swirl from the Soap Queen Tutorial. It is not perfect, but I love how it came out!” I loved the techniques you used to make this soap work for you, Juli! Would you like your photo or project to be featured in a blog post? Come join us for soap talk, contests and lots of crafting inspiration at Bramble Berry’s Facebook page and share a photo with us of your latest project. 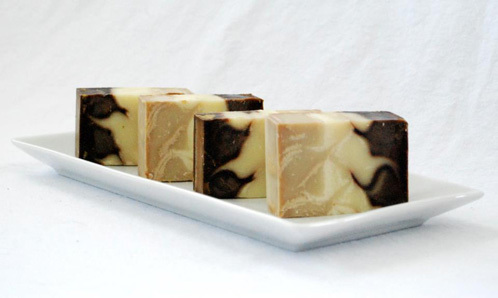 And remember, you still have a chance for your soapy recipe to get featured on the Teach Soap website (and a chance to get a $10 Bramble Berry Gift Certificate), send us an e-mail with a full tutorial, including pictures at [email protected]. For more details, check out this blog post and our featured recipes, Soothing Avocado Foot Balm, Peach Pie Soap and Rose Garden Bath Tea. Bramble Berry + Willow and Sage Giveaway Set Your Goals for 2017 Facebook and Instagram Photo of the Week (July 18th ~24th) Facebook and Instagram Photo of the Week (July 9th ~ July 17th) #SoaptheRainbow Series & Contest! P.S. Be looking for a special little package in the mail! 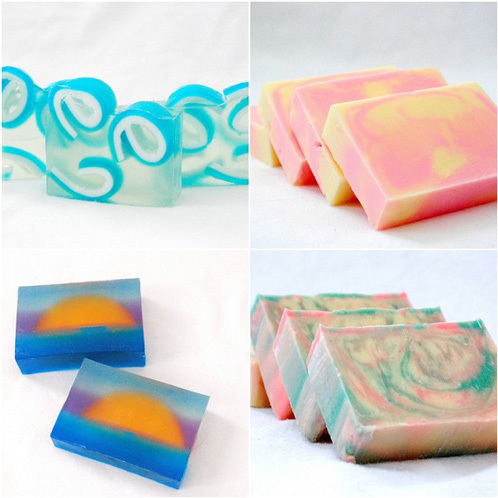 Wow, Juli’s soaps are stunning! I love the mantra swirl and the sunrise soap is amazing! Those soaps are amazing! Wow! !